The DNR submits reports twice a year to EPA on the use of brownfields grant funds to enhance its state response program and to fulfill public record requirements. The RR Program’s mid-year report to the EPA, which details outputs and outcomes funded by a federal grant, is now available for review. 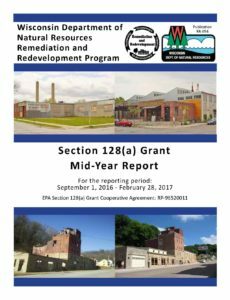 The Section 128(a) Grant Mid-Year Report, for the reporting period of September 1, 2016 to February 28, 2017, highlights work completed in the first half of the funding year. Since 2003, the RR Program has consistently and efficiently used these funds under a cooperative agreement with the EPA to enhance state efforts with brownfields cleanup and redevelopment. Previous reports can be found on the Brownfields Program web page. The RR Program’s annual brownfields accomplishments report to US EPA, which details outputs and outcomes funded by a federal grant, is now available. The Section 128(a) Grant Final Accomplishments Report, for the reporting period of September 1, 2015 to August 31, 2016, highlights work completed in past the funding year. 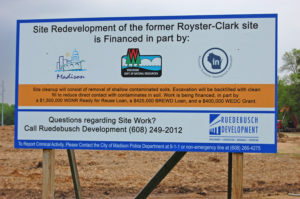 Since 2003, the RR Program has consistently and efficiently used these funds to enhance state efforts with brownfields cleanup and redevelopment. Previous 128(a) reports can be found on the Brownfields Program webpage. 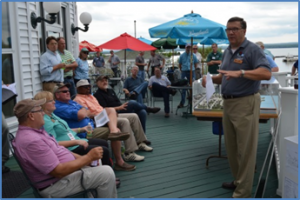 Northern Region RR Program Team Supervisor John Robinson provides members of the Natural Resources Board with an update on the cleanup work at the Ashland/NSP Superfund site during the Board’s August 2-3, 2016 tour and meeting in northern Wisconsin. Natural Resources Board members got an up close look at the Northern States Power (NSP) Superfund site during the Board’s August meeting and tour in Ashland. DNR and the US EPA have been managing work on this lakefront site since contamination was discovered in the late 1980s. Phase I of the cleanup was completed in 2014, with groundwater monitoring continuing for several years. Phase II includes cleaning up impacted sediment from near the shoreline, with a “wet dredge” pilot project underway and scheduled to be completed later this year. During the Board’s formal meeting on the second day of its visit, DNR Sec. Cathy Stepp announced that the City of Ashland had officially received a mix of brownfields redevelopment awards totaling nearly $450,000. The awards, from DNR’s Ready for Reuse and Wisconsin Assessment Monies programs were provided to help the community assess and clean up several properties and get them ready for redevelopment. Read the full press release. 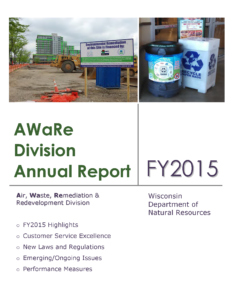 Take a bow, RR Program, your FY2015 successes and milestones are front and center in the latest Annual Report from DNR’s Air, Waste, and Remediation and Redevelopment (AWaRe) Division. The 29-page report examines and highlights program successes in customer service, new laws and regulations, emerging and ongoing issues, and measuring program performance. During the reporting period, the RR Program celebrated its 20th anniversary. Since 1995, staff have worked with partners across the state, helping to clean up more than 15,000 brownfield properties and returning more than 20,000 acres back into productive use. 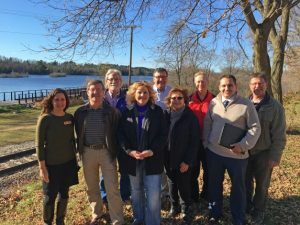 The program marked the anniversary by continuing to work with our external advisory partner, the Wisconsin Brownfields Study Group, to create its 2015 Report – Investing in Wisconsin, which outlines proposals that will make a strong program even better. Other RR notables in the Division Report include updates on major redevelopments in the Fox Valley and Madison, RR efforts to help clean up the former Badger ammo plant, and outreach achievements that help keep our partners and stakeholders informed and involved. The Division’s commitment to service excellence was demonstrated by the fact that 97% of our customers who completed our survey indicated they were very satisfied or satisfied with the service they received from staff. This is the AWaRe Division’s final annual report. The Division has merged with several DNR water programs and has formed the new Environmental Management Division.